Four years ago, on a day like today, I created my first blog on WordPress. That blog was for a class and it has led to a collection of four different blogs. Only 2 of these were visible because the other 3 were created for classes. Unstoppable Maria is the only one I currently share on different types of social media (Facebook, Twitter, Tumblr, Instagram). I use the other visible one for a class I am taking right now, the other two are still there but were no longer visible. I just made them visible again so people can see them now, as I share them tonight and see what I learned in college and get a better idea of what I can do. The first one I created was mariacristinasanfeliu@wordpress.com, which was pretty much my writing portfolio. It has 5 sections: About me, Articles, Essays, Information Design and Resume (which I should update). The next one was mariasonlinescrapbook.wordpress.com. This was a class project where we had to put a picture that represented a word we were given. This project lasted a few months. And I will not include the third blog because I am currently using it in class. Please visit each one and let me know what you think. And yes, I had to read E! news, I had to know what’s up with Gwen and Blake. According to E! the news is… they are dating. Now I’m just waiting for next Monday to see what Adam has to say about that. 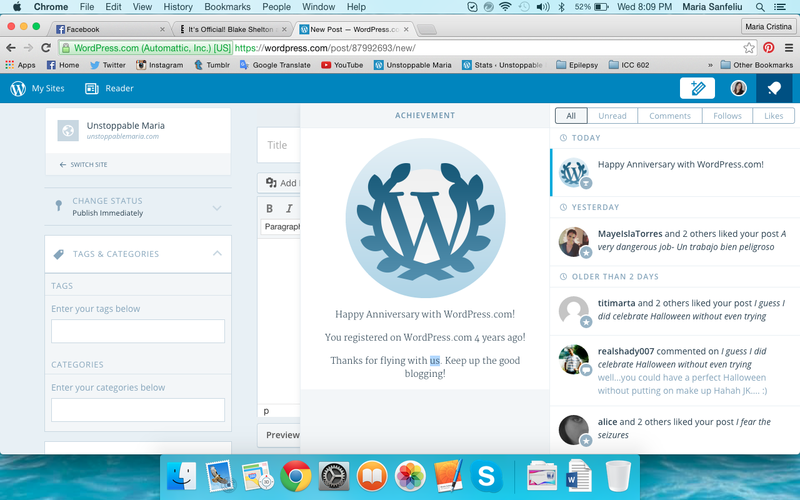 WordPress, thank you for remembering our 4 year anniversary !!! It has been a fun journey and it’s not over yet.